Most people love to visit foreign countries and explore new locations, but independent traveling has its pitfalls like applying for a visa, booking a suitable hotel, and snatching the best-priced air tickets. Those who are still new to the world of tourism need a person who will guide them through the ins and outs, and take care of all the unpleasantries. As a travel agent, you are the one to uplift these problems from the shoulders of tourists so that they can focus on positive emotions and thoroughly enjoy their trip. 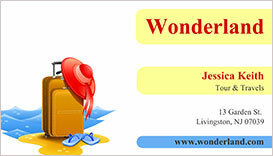 But how to get people choose you as their most reliable travel consultant? 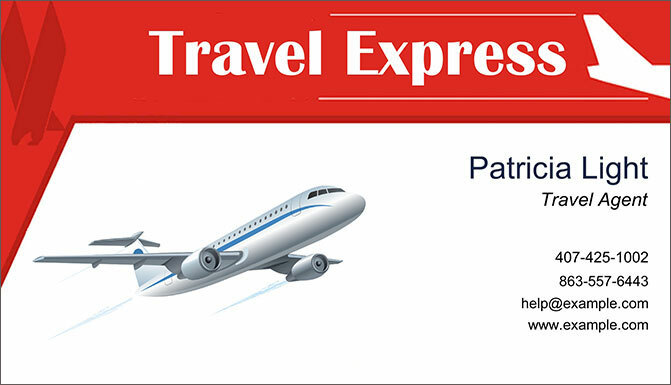 It is often said that the first impression is the most lasting, and experienced travel consultants convince people to come to their office with the best promotional tools – travel agent business cards! These small designs help people of any profession to stay a step ahead of the competition and give their prospective clients a general idea of the services provided. If you want one-of-a-kind business cards to present your credentials in a favorable light, get started with a special application and create memorable card designs with your own hands. 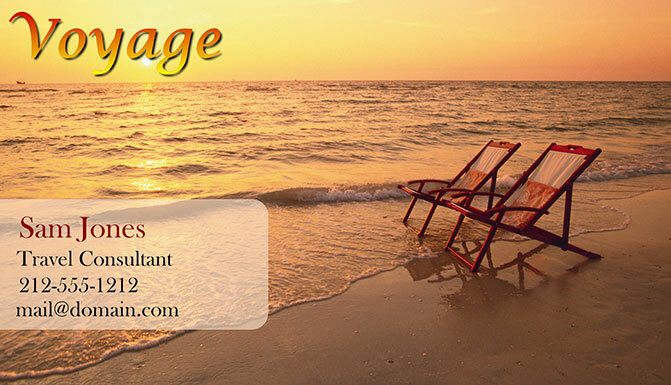 A professionally designed business card tells your potential customers that you are a pro who knows the business. 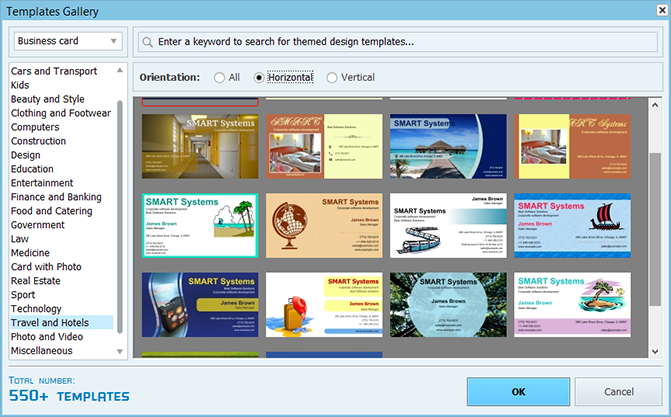 If you have already come up with the image of your future calling card and do not want to describe it to some random designer, make your own card design with Business Card Maker software! This is an efficient program to make business cards that is equipped with a wide range of themed templates to choose from, numerous editing tools to customize your cards and many print options to get the best paper copies. Eager to learn more secrets of business card creation? Keep on reading and learn how to make your dream card design! This business card showcases a very eye-pleasing combination of silver, white and green coupled with a rather simple layout. Don’t feel like you need to include detailed graphics, lots of contact information, and tons of intricate logos. Even a simple card can speak volumes and create a lasting impression while not overwhelming prospective clients with fussy images and overabundant data. Adopting the colors that are easily associated with the whole of the Earth, this business card includes a themed logo and symbolically represents all the places you can visit with the help of a travel agent. The overall card design should be visually interesting but not too fussy. So what kind of imagery you may include into your business card? If you are a travel consultant that does certain countries, you may want to base your card design on some pictures taken in that location. That way you will be able to create a link between your business card and the intended destination, and attract new customers. For example, you specialize in trips to tropical countries, so you may go with a corresponding color palette with yellows, oranges and pinks. Vivid colors can help your card be picked up more than a simple black and white design. The same goes for fancy pattern backgrounds. This card example presents information in a very clear manner while still managing to have some visual interest. Thanks to its themed textures and a calm color scheme, the overall design looks friendly and informal, and identifies the card’s owner as a highly creative person. Yet, it uses an easy-to-read font and fulfills its key function – provide sufficient contact information so that prospective customers dial your number. It is only natural that the travel industry has its own imagery and themes, and if you decide to include these elements into your design, it will help people remember why they accepted your card in the first place! So what pictures or clipart to insert? Anything that you think clients will immediately recognize and be drawn to! 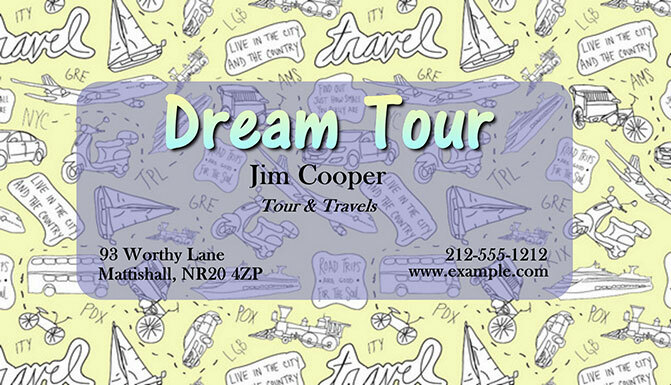 If you cast a glance over this business card, its color scheme and embellishments will drive home the point that you hold a travel consultant card. Not to mention, this card design is extremely eye-catching and is likely to be picked up and kept for longer. One must be on their toes to beat out the competition in such kind of business like the travel industry. Make sure that your travel agent business cards are at the fingertips of all of your customers whether they plan their honeymoon or some regular holiday trip. Pay attention to the latest trends and get creative in order to entice people to pick up your calling card as well as make the link between the offered services and the destination in question. That way your clients will keep coming back for more! Design and print business cards like a pro with Business Card Maker! * For Windows 10, 8, 7, Vista, XP. File size: 147 MB. Full version price - from $27.00.